The findings also demonstrated a significant 1.5-fold OS benefit (P = .04) when administering surgery and systemic treatment sequentially, as opposed to together in a paralleled scheme. According to the investigators, previous studies have demonstrated an OS benefit in mRCC with complete metastasectomy2 and cytoreductive nephrectomy,3 compared with systemic therapy alone. However, findings have been inconsistent on whether including iME with systemic treatment improves outcomes versus systemic treatment alone. The researchers collected data on 147 patients treated at a single center between 2008 and 2015. Patients had clear cell mRCC, prior nephrectomy, an ECOG performance status ≤2, and measurable metastases. Patients also had to be eligible for local surgery. The most common sites of metastases were lungs (70%) and bones (28%). Forty-seven patients (32%) received iME plus systemic treatment and 100 patients (68%) received systemic treatment alone. In the combination cohort, 20 patients received iME and systemic therapy sequentially, with a break of at least 3 months following the surgery. The remaining 27 patients underwent a paralleled scheme, with iME and systemic therapy delivered at the same. First-line treatments received in the iME arm included interferon-alpha (n = 15), sorafenib (Nexavar; n = 16), sunitinib (Sutent; n = 15), and pazopanib (Votrient; n = 1). In the control group, patients received interferon-alpha (n = 40), sorafenib (n = 26), bevacizumab (n = 10), sunitinib (n = 13), and pazopanib (n = 11). Eighty patients (54.4%) from across the trial received second-line treatment, including 26 patients (55%) in the iME group and 54 (54%) patients in the control arm. Across all 80 patients, second-line treatments included sorafenib (n = 27), sunitinib (n = 21), everolimus (Afinitor; n = 15), axitinib (Inlyta; n = 11), pazopanib (n = 4), and bevacizumab (n = 2). Twenty patients from across both cohorts went on to receive third-line systemic treatment, including everolimus (n = 7), sunitinib (n = 4), sorafenib (n = 4), and pazopanib (n = 5). Of these patients, 4 received further treatment; however, the researchers did not list which therapies were administered. At a median follow-up of 31.2 months (range, 3-82), the median OS was 32 months in the combination arm compared with 29 months for systemic therapy alone (P = 0.3). A clear OS benefit was also demonstrated in the combination cohort for patients receiving iME before systemic therapy compared with those receiving the treatments together. The median OS was 46 months for the sequential group versus 31 months for the paralleled group. The addition of iME to systemic therapy also significantly increased progression-free survival (PFS) in the first-line setting (P = .018), but did not have a significant impact on PFS (P >.1) among patients who went on to receive second- or third-line systemic therapy. Borisov P, Orlova R, Schkolnick M, et al. 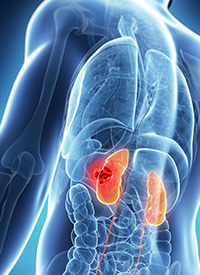 Efficacy of incomplete metastasectomy in combination with targeted therapy in metastatic renal cell carcinoma patients. Presented at: 2017 EMUC Congress; Barcelona, Spain; November 16-19, 2017. Abstract P101. Alt AL, Boorjian SA, Lohse CM, et al. Survival after complete surgical resection of multiple metastases from renal cell carcinoma. Cancer. 2011;117(13):2873-82. doi: 10.1002/cncr.25836. Heng DY, Wells JC, Rini BI, et al. Cytoreductive nephrectomy in patients with synchronous metastases from renal cell carcinoma: results from the International Metastatic Renal Cell Carcinoma Database Consortium. Eur Urol. 2014 Oct;66(4):704-10. doi: 10.1016/j.eururo.2014.05.034.